AAHHH… That’s my sigh of relief and happiness. Our dinner party couldn’t have gone any better. I am so pleased. My dad, mom, stepdad, Zack’s parents, two brothers and his brother, Caleb’s, girlfriend all came! We have tons of leftovers, though. I sent two whole trays of food home with my dad. Next year, I won’t double the recipes like I did this time. Everyone said everything was really good. 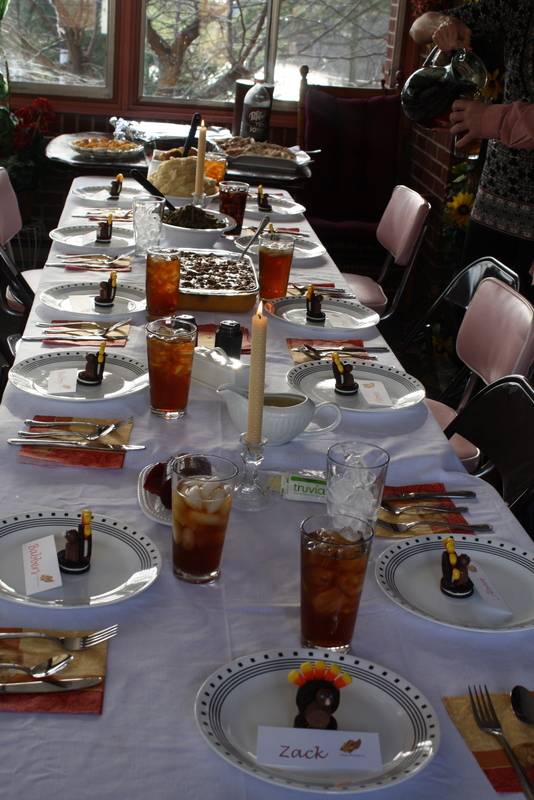 I’m so thankful for both of our families and for the fact that everyone gets along so that we can have dinners like this. I spent all of today and yesterday cooking. I am exhausted. It feels so good to be sitting on my couch with my Zack doing nothing right now. 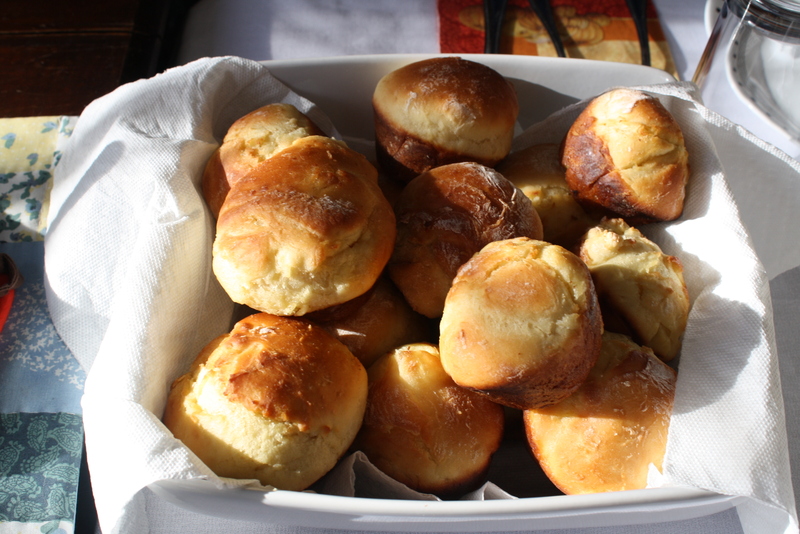 I’m just going to share all of the recipes from today in this post. I hope you enjoy. Be thankful for your families and for the time you get to spend with them. I know I am. 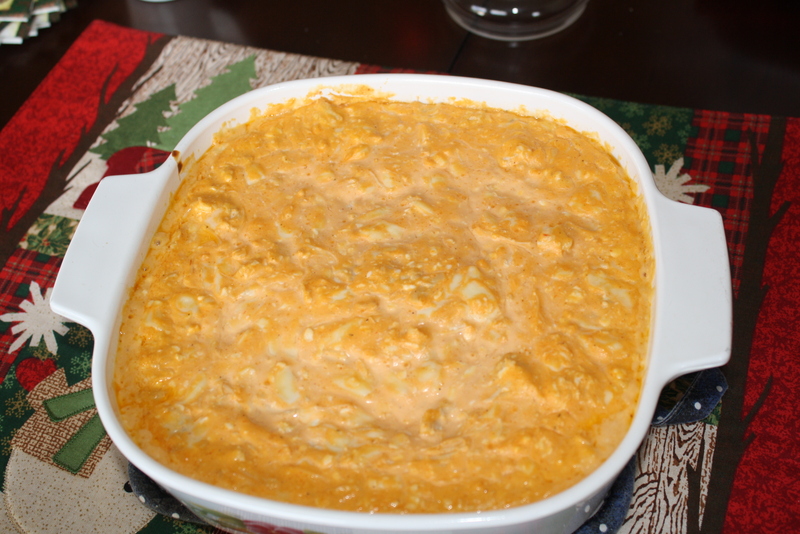 In a large bowl, beat the cream cheese, sour cream, salad dressing, and buffalo wing sauce until blended. Stir in chicken and Monterey jack cheese. Transfer mixture to a greased 2-qt baking dish. Cover and bake at 350 degrees for 25-30 minutes or until hot and bubbly. 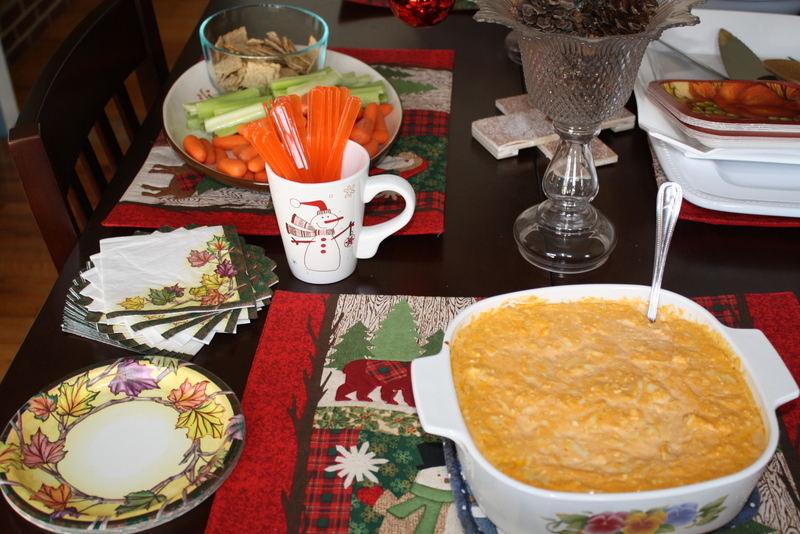 Serve dip warm with baby carrots, celery, and crackers. Our main table. 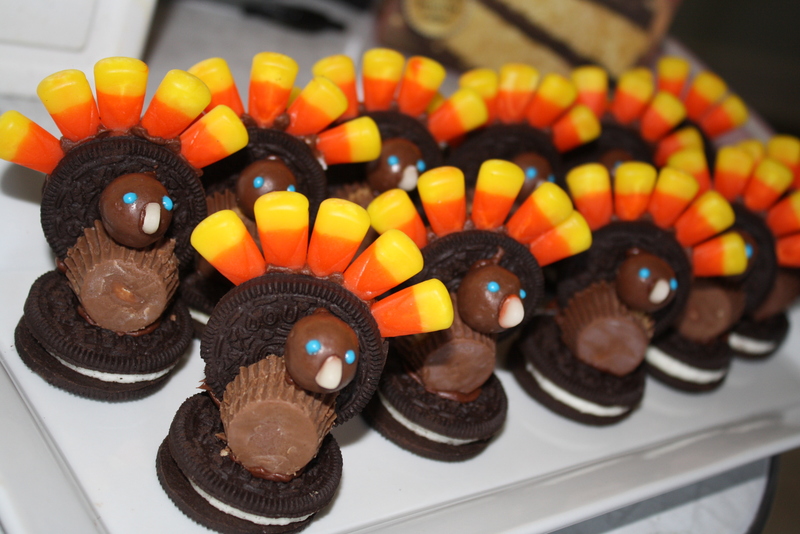 We used the oreo turkeys and little name cards as place cards. I think it turned out adorable. Preheat oven to 350 degrees. Thoroughly rinse turkey. Brush turkey with melted butter. Place breast side up on a roasting rack in a shallow roasting pan. I cooked mine in an oven bag in a roasting pan. Stuff the turkey cavity with 1 onion, 1/2 the carrots, 1/2 the celery, 1 sprig of thyme, and the bay leaf. Scatter the remaining vegetables and thyme around the bottom of the roasting pan (in the bag for me) and cover with white wine. 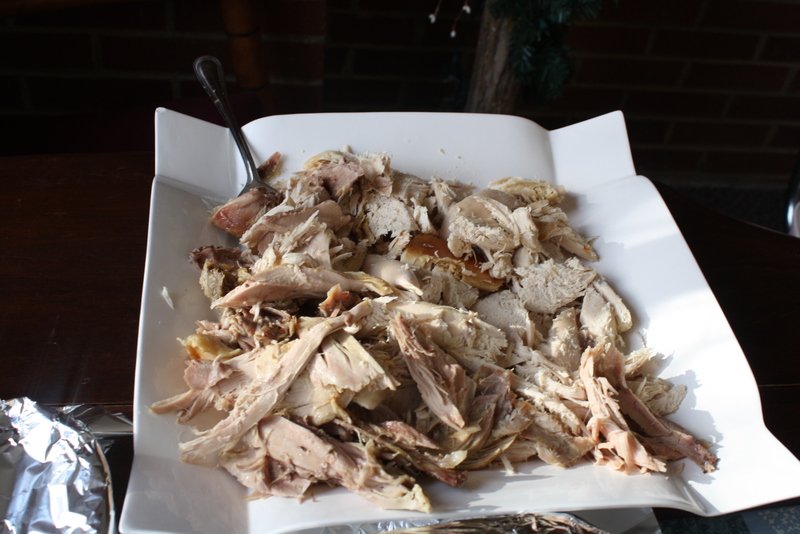 Roast uncovered 3 1/2 – 4 hours in preheated oven until internal temperature of thigh reaches 180 degree. Allow the bird to stand about 30 minutes before carving. Prepare a muffin tin for baking by spraying it with nonstick cooking spray, or tossing a small pat of butter into bottom of each cup. Set aside. In a large bowl, mix yeast in 1/4 c warm water until dissolved. Add the sugar. Whisk in the salt and eggs. Beat in milk and remaining water until well mixed. Use a wooden spoon to stir in about 2 1/2 cups of flour, adding more (up to 3 cups) as necessary to make a soft dough. You want to be able to knead the dough and not have it stick to your fingers, but still have the dough be soft and pillowy. Less is definitely more here. Knead dough a few times. Roll out dough to 1/2″ thickness and spread with a thin layer of butter (it should be about 2 tablespoons). Fold dough in half, then spread with butter. Repeat this 4 more times. Once you’ve finished buttering, roll into 1/2″ thickness and cut dough into 1×1 inch squares. Place 3-4 squares in each non-stick sprayed muffin tin. Let rise about 45-60 minutes or until well-risen. Bake in middle rack at 400 degrees for 10-15 minutes or until golden brown. Combine stuffing, boiling water and 2 T butter. Cover and let stand 5 minutes. Top each ham slice with a cheese slice. Spoon 1/4 c stuffing mixture over center of cheese; roll up and secure with a toothpick. Whisk eggs and water together. 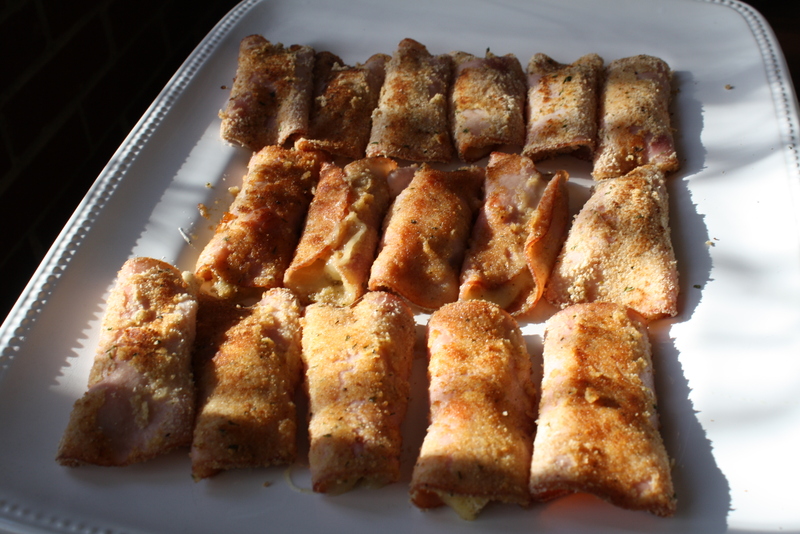 Roll ham rolls in egg mixture, then roll in bread crumbs. In a large skillet over medium heat, saute ham rolls in remaining butter for 4-5 minutes, or until golden, turning only once. Discard toothpicks before serving. Prep: 10 min. Cook: 7 min. Bring chicken broth to a boil in a large saucepan. Stir in soup and season with poultry seasoning, pepper, and garlic powder. Reduce heat to low and let simmer. Warm the milk in the microwave and whisk in the flour and cornstarch with a fork until there are no lumps. 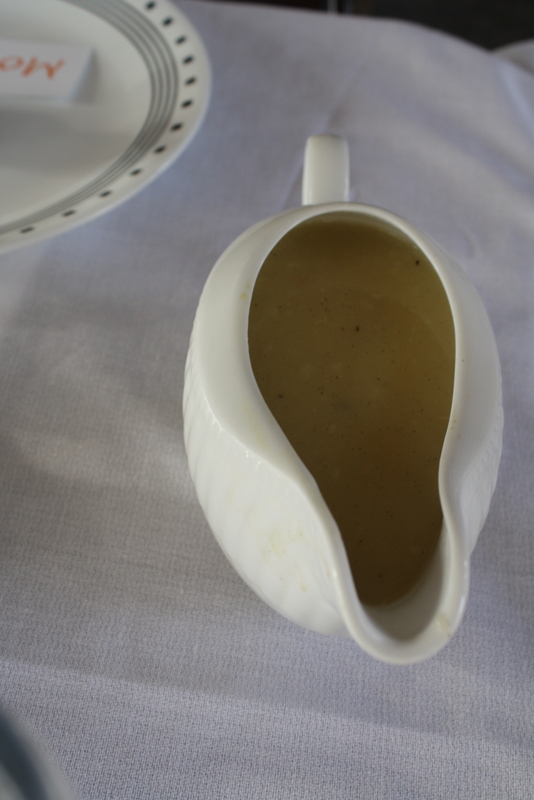 Return the gravy to a boil, and gradually stir in the milk mixture. Continue to cook, stirring constantly, for 1 minute or until thickened. Be careful not to let the bottom scorch. Preheat oven to 350 degrees. Melt butter in a large pan. Saute onions, celery, salt, sage, and thyme for 5 minutes on medium heat. Turn off heat. Add bread cubes and gently stir them into the onion mixture. Slowly pour chicken broth over the bread cubes folding everything so the bread cubes do not break apart too much. In a small bowl, gently whisk the egg and add it to the stuffing mix. Continue to fold everything until the egg is incorporated. 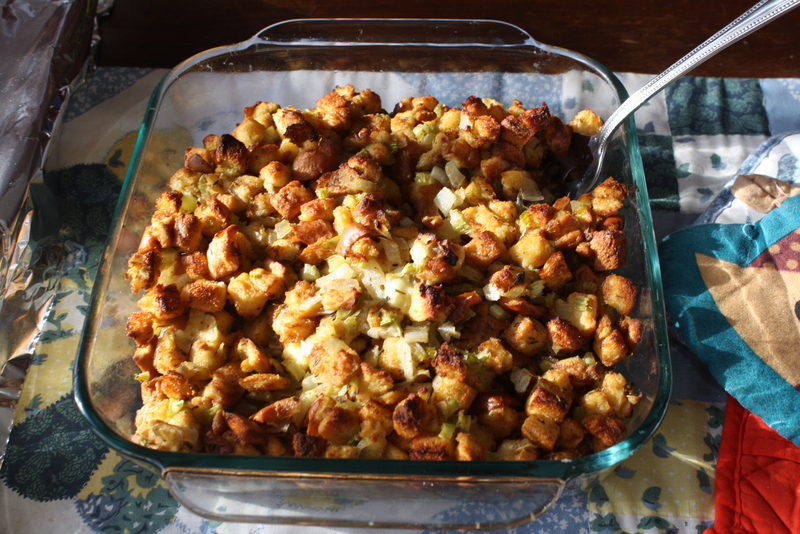 Scoop uncooked stuffing into a medium casserole dish and bake uncovered for 40 minutes or until nice and toasty on top. Place potatoes in a large saucepan. Cover with water; bring to a boil. Cook over medium high heat for 15-20 minutes or until tender; drain. Return potatoes to saucepan; add evaporated milk and butter. Beat with hand-held mixer until smooth. Stir in cheese. Season with salt and pepper. Combine with mixer and pour into greased casserole dish. Mix well and distribute over potatoes. Bake 30 minutes at 325 degrees. 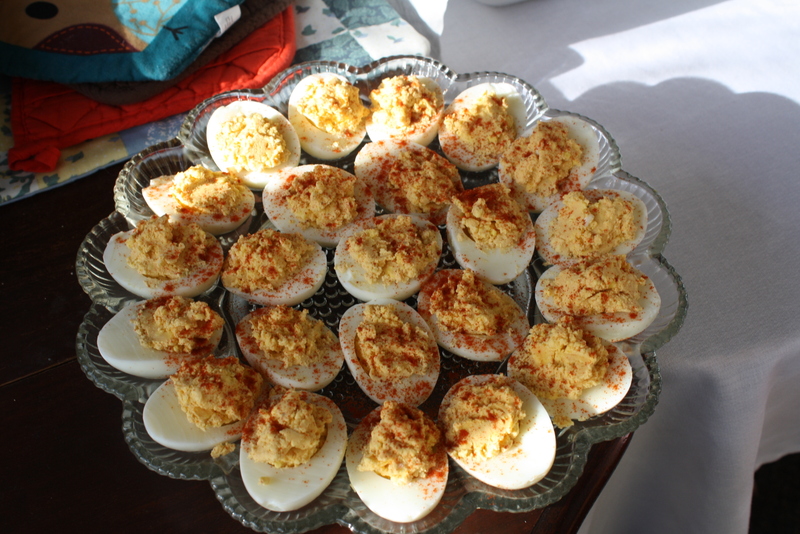 See Deviled Eggs for recipe. 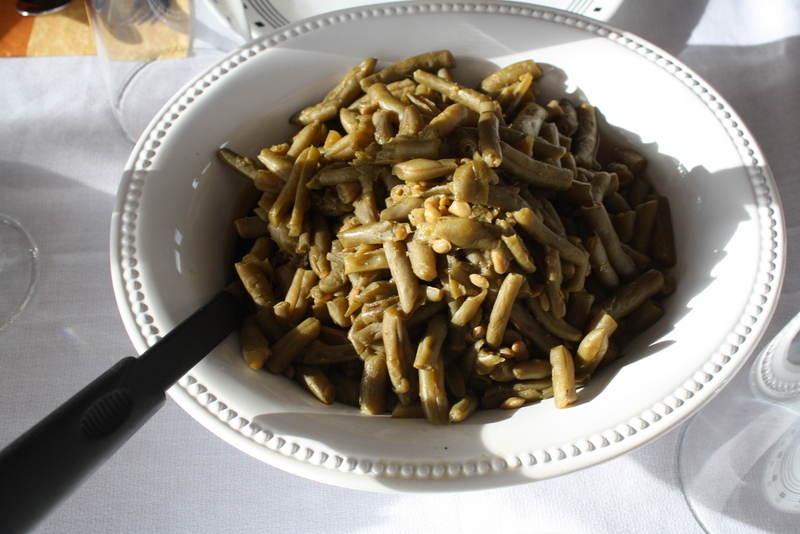 Just take some green beans, I used about 3 lbs here and then add a bouillon cube (1 per lb). Bring to a boil then simmer. The longer you let it simmer, the better they are. Prep: 20 minutes. Bake 50 minutes. Beat sugar, butter, corn syrup, salt and eggs in medium bowl with wire whisk or hand beater until well blended. Stir in pecans. Pour into pastry lined pie plate. Bake 40-50 minutes or until center is set. Prepare and bake cake according to package directions using 2 greased 9-inch round baking pans. Cool for 10 minutes before removing to wire racks to cool completely. In a large bowl, whisk milk, pudding mixes and apple pie spice for 2 minutes. Let stand for 2 minutes or until soft set. Cut one cake layer if necessary to fit evenly in an 8-quart punch bowl. Poke holes in cake with a long wooden skewer. Gradually pour a third of the caramel topping over the cake. 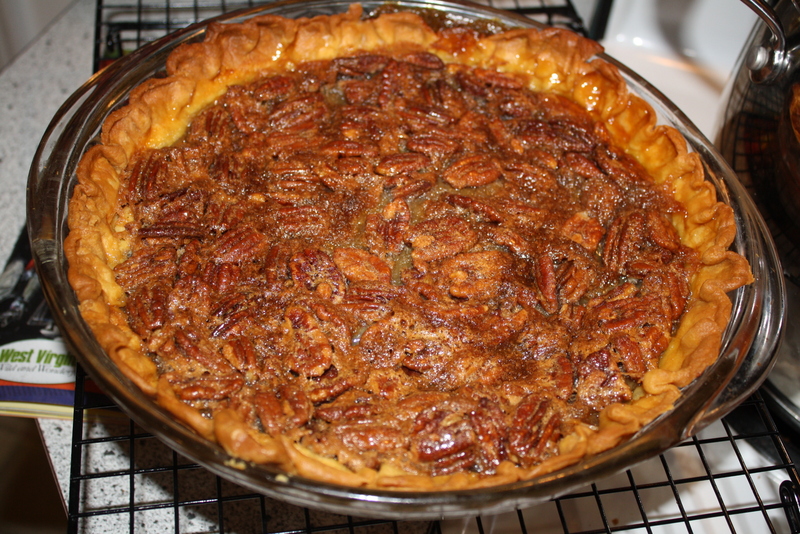 Sprinkle with 1/2 c pecans and spread with half of the pudding mixture. 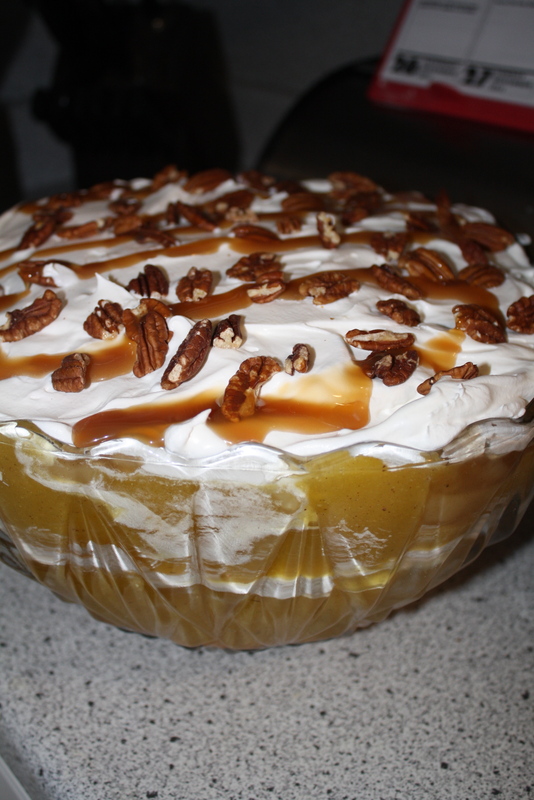 Spoon one can of pie filling over pudding; spread with 1 carton of whipped topping. Top with remaining cake and repeat layers. 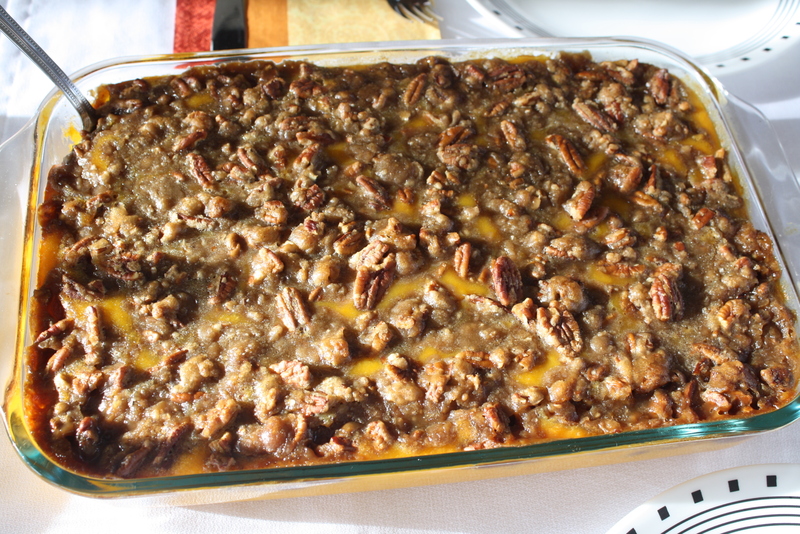 Drizzle with remaining caramel topping and sprinkle with remaining pecans. Refrigerate until serving. Prep: 20 minutes. Bake 1 hr 10 minutes. Cool 2 hours. Heat oven to 425 degrees. Make pastry for unbaked one pie crust; before adding filling, partially bake pastry (carefully line pastry with double thickness of aluminum foil, gently pressing to bottom and sides of pastry. Let foil extend over edge to prevent excess browning. Bake 10 minutes; carefully remove foil and bake 2-4 minutes longer or just until pastry begins to brown and has become set. If crust bubbles, gently push bubbles down with back of spoon.. Beat eggs slightly in medium bowl with wire whisk or hand beater. Beat in remaining ingredients except whipped cream. Cover edge of pie crust with 2-3 inch of aluminum foil to prevent excess browning; remove foil during last 15 minutes of baking. To prevent spilling filling, place pie plate on oven rack. Pour filling into hot pie crust. Bake 15 minutes. Reduce oven temperature to 350 degrees. Bake about 45 minutes longer or until knife inserted in center comes out clean. Cool on wire rack 2 hours. Serve with whipped cream. 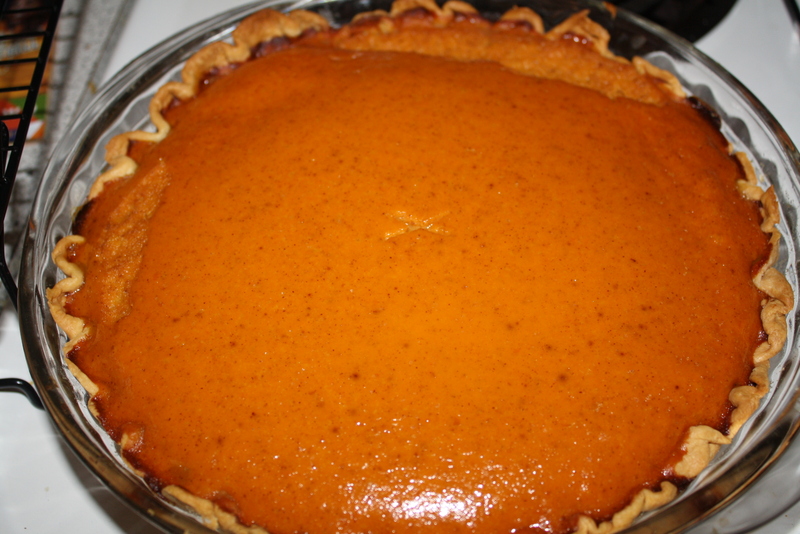 After cooling, pie can remain at room temperature up to an additional 4 hours, then should be recovered and refrigerated. Grab a cookie and put some chocolate icing in the edge. Stick some candy corn in. The icing makes it stick better. It’s easier if you do all the cookies through this step. Next, secure the opposite end of those cookies to a bottom cookie with a gob of icing. If they are not sturdy, you can set them against the wall until the icing hardens a little. While they are drying, unwrap the peanut butter cups. Take a sharp knife and cut a sliver off of one end. It helps to gently cut in a sawing motion so you don’t break the peanut butter cup. Cut from the bottom. Place a gob of icing on the peanut butter cup and place it on the bottom cookie. Glue a whopper on top of the peanut butter cup with icing. I put frosting on the side of the whopper touching the peanut butter cup and the cookie. Use another gob of icing and glue on the white tip of a candy corn for a beak. Put two dots of your writing icing for eyes. Float a few apple slices and some cinnamon sticks in the drink as it warms. 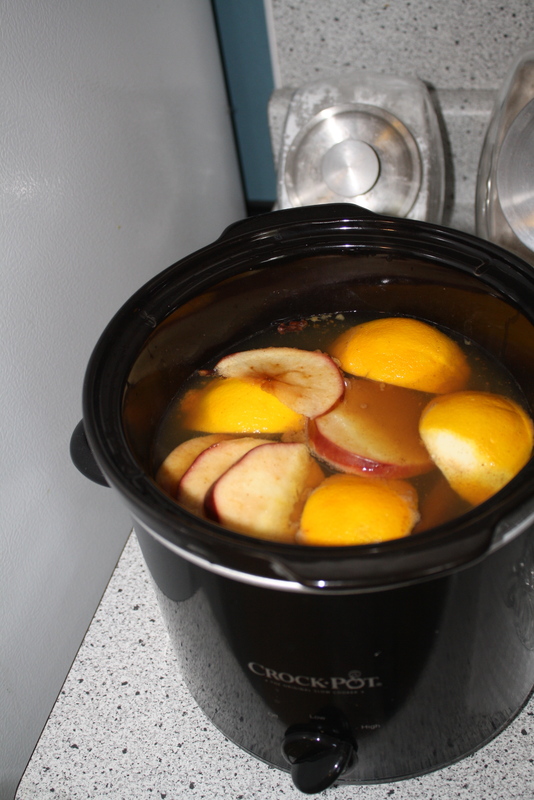 Combine all ingredients in a 3-quart slow cooker; cover and cook on low 2-4 hours. Remove orange sections and spices before serving. Looks wonderful Jenn! I’m glad it was a success. It is a lot of work but so worth the effort isn’t it? Especially if you’ve got a new family tradition! Thank you! It was definitely worth the effort. Family is very important to me and Zack. 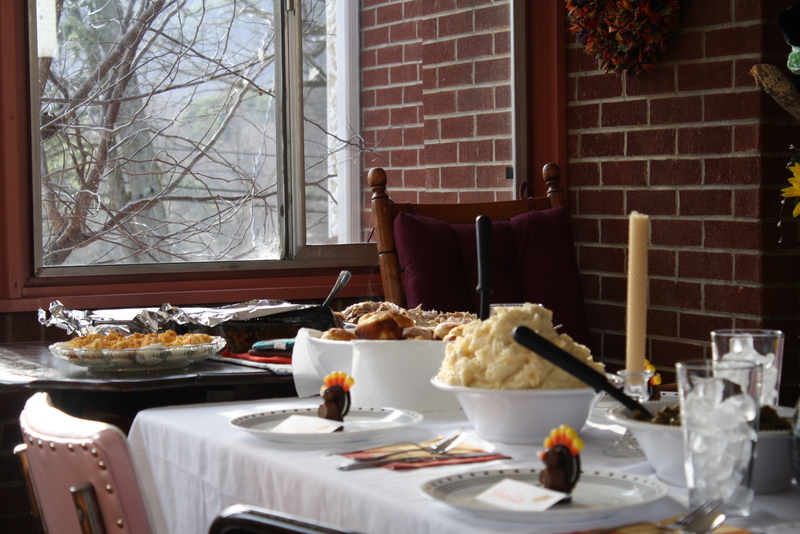 It all looked delicious and the table was beautiful. I bet you got all kinds of compliments. Thank you! Zack actually set up the table. He did a great job. That was a real FEAST!! Wow, girl, you were busy! Everything looks so delicious! Glad it was a success! Thanks! I had to catch up on sleep today. Preparing a dinner party is completely exhausting! Well done and congratulations for producing such a wonderful feast. Awesome festive post! Love all the dishes, and it looks like there are all so tasty!!! Thanks for sharing and have a wonderful Holiday season! Thank you! I hope your holidays are wonderful, too! There’s nothing better than spending the holidays with the ones you love. 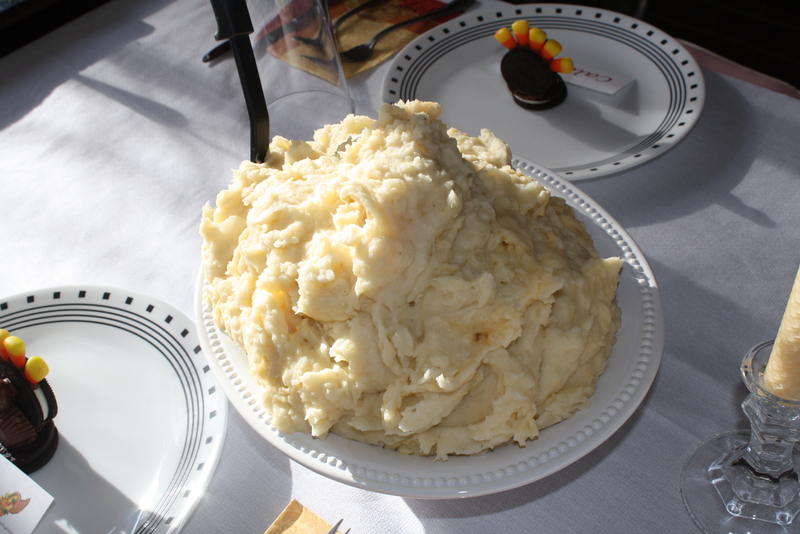 Congratulations on your first successful Thanksgiving! I hosted for the first time as well this year and it was a bit overwhelming but totally rewarding. Hope you had a great Holiday!